Hey all! Shannon and I are currently in Florida, at the International Association for the Fantastic in the Arts conference, ICFA 38! Shannon is presenting a paper tomorrow (Thursday), and has spent the last several weeks making sure it’s in great shape. I’m excited to hear her deliver it, it’s really well done. Because of all this, we’re really busy, and don’t have a full Wednesday post for y’all this week. We will get you a full con report soon, and I can probably talk Shannon into posting her paper as well. I still owe you a WorldCon report for last year–that’s in the works, and will be out eventually. I’m reading a lot of books now that I’m done beta reading, and oh, it feels sooooo good. 🙂 More about those books later too, of course. For now, here’s a picture of us WAY too early this morning, waiting for our flights out of Austin. The movie has a really interesting premise, which I don’t feel is quite adequately portrayed in the trailer. It shows the story of Christian Wolff, an accountant with some very special talents. Wolff has high functioning autism, and an incredible talent for numbers. He works for high profile corporations, and occasionally mobs and other shady operations, finding errors in their accounting records. He runs a small town accounting firm, helping local citizens with their taxes, as a bit of a front. He is also very good with a number of weapons, and can fight proficiently with everything from his hands to a sniper rifle. The movie follows his story as he tries to uncook the books for a massive corporation, where there are (of course) some deep-seated problems which lead him down dangerous roads. The action that ensues is quite good. The fight scenes were all well choreographed, and quite exciting. None of them were too long, and I never really felt any action fatigue. Some of them were a little on the brutal side for my taste, but it fit the tone of the film, so I didn’t really mind. The overall plot was fairly straightforward. I got lost a few times, and had to ask the friend who saw the movie with me to explain some of the more subtle elements to me after the movie was over, but overall, it was engaging and solidly done. I was quite happy that the writers didn’t try to force any unrealistic romance into the movie. Wolff has high functioning autism, and he is, accurately, socially awkward. He is not the kind of person who would quickly form romantic attachments, or attract other people to him. There were definitely moments in the movie where the writers could have used the trope of having the hero be universally loved, but it would have felt horribly forced and out of character, and I am very glad that it was not done. Not just with the romance, but overall, the portrayals of autism in the movie felt very authentic. The scene where Wolff is obsessively working on an accounting set of books, for example. The level of attention he gives to the work, the way he sets everything out so he can see it, and his reaction when his work are interrupted are all spot on. In addition, his sensitivity to noise, his desensitization training, and everything down to the little details like how he arranges his food on his plate, give the movie a very authentic and accurate feel. I absolutely loved this aspect of the film. Five out of Five stars, easily. I’ll be watching this one again on my computer at some point, I’m absolutely certain. Mark here. I’ve been really absent lately, and I’m sorry about that. I’ve got my excuse, but… It’s an excuse. I’d say it’s a pretty good one, too, though. You see, I was beta reading Oathbringer. According to this post, it is currently ~514,000 words long. For some perspective, the entire Lord of the Rings (The trilogy, not just one of the books.) is only 473,000 words long. So the beta reading process took about 2.5 months. I might talk about it somewhere later, but for now, all I’ll say is it was intense, exhausting, rewarding, and it’s over. Also, Oathbringer is a freaking amazing book and you want to preorder it now. November 14th is the release date, and you will want to read this as soon as you can. Trust me. But that is done now, and I’m back. I’ve got a (movie) review ready for later this week, and I’m starting several other books very soon, in hopes of getting back on track with the blog. I’d like to finish with a huge thanks to my coblogger Shannon for keeping things running while I was busy on Roshar! I read this book because it was one of last year’s Hugo Nominees. This book was very much hard sci-fi. Much harder than most of the other books I’ve read, and probably too hard for a lot of people. 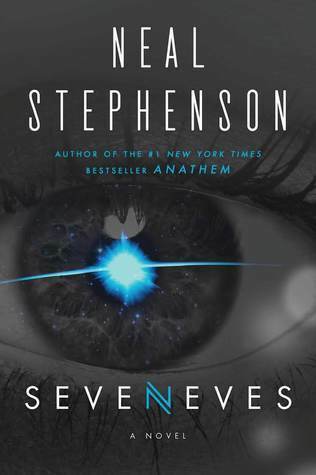 If you want a story about just characters, Seveneves is probably not the book for you, though that doesn’t mean those stories aren’t there. I would personally have to say that I enjoyed it, in part, because of the science, rather than in spite of it. It is explained so well, and in a way that is so relevant to the plot, that it never bored me. I’m generally much more of a fantasy geek than a sci-fi nerd, and will happily read pages on invented magic systems. Stevenson managed to turn the science here into a fascinating story, even without extrapolating very far into the future for most of the ideas. That being said, this book had one major problem, one jarring element, that kept it from being amazing for me. WARNING: If you highlight the next paragraph, there are MAJOR SPOILERS for part of the plot. The first 2/3 of the book are an intense, brutal, amazing survival novel. Then, once we have survived as a species, it jumps thousands of years into the future, starts over with a completely new set of characters, and follows an entirely different plot—that of our return to Earth. I found this jump to be jarring, unnecessary, and it darn near ruined the book for me. It didn’t feel like the same book at all. Honestly, if I could just go read the first 2/3 of the book, and consider it a complete novel, I would be perfectly happy and I would have enjoyed the book a lot more. Then the last 1/3 can be a companion novel, released a few years later. They should not be called the same book, at all. The book did not move quickly at any point. There was no overwhelming sense of urgency to the plot, no need to get things over with and get to the next exciting bit. Rather, it took its time and it did it incredibly well. It still managed to have a rising tension that permeated basically every page, and somehow drew me through the entire thing. I’m not sure how well it would hold up to a reread—and I don’t honestly intend to find out—but it gripped me on my entire first reading. The premise of the book is very simple, and it’s laid out on the first few pages. It’s a simple “What if?” question that I’m sure many people have contemplated before. I didn’t even feel that any of the results or reactions to the inciting event were outlandish—every decision felt realistic, every happening totally possible. It scares me a little bit, sometimes, how easily our modern society could fall into chaos and disappear. The progression of ideas, and the level of intriguing plot and tension that Stevenson was able to create with such a simple idea shows off his skill—you don’t need a list of “WOW!” ideas to make a great book, you just need everything to be solid, and be a good writer. Not only did I feel that all of the scientific extrapolations in the book were solid and believable, but also the character actions and reactions. People made some bad decisions, and I sometimes wanted to bash their heads together and just yell at them to cooperate. I was able to get inside the heads of several of the characters from the book, and in many cases, I cannot deny that I would also have made some very bad decisions had I been in their places. The title of the book makes no sense before you read it—I wasn’t even sure how to pronounce it until I figured out what it meant. Once I did figure that out. . . I think it’s genius. But I won’t spoil it here. In summary, Seveneves was a very good book, with understandable character decisions and a believable sci-fi plot, that, despite it’s slow pacing and simple premise, entranced me and drew me through. Unfortunately, there’s then another book that is half the length of the first one, tacked on to the end, and it didn’t fit at all, though it was good in its own right. I’m going to give it three of five stars, and recommend that you at least read the first two parts—but if you don’t read the third part, you’re doing just fine. I’m mostly done with a very nice WorldCon review post that’ll probably have to be split into two or three parts. I was planning to have it all ready tonight for upload. Then this thing called Oathbringer came along for beta reading. This book has been compared to World War Z (which I have not yet read), in part for its format. It’s a very interesting format. I wouldn’t quite classify it as found footage, but it’s not really an epistolary either. It’s told through interviews, occasional surveillance videos, and other such things. Mostly the interviews, though. Perhaps the most similar book that I’ve seen recently is Illuminae. (This one doesn’t have any illustrations, though.) The format is done really well, though there are times I could tell that the author was forcing himself to use the format, and it doesn’t really fit. Overall, though, it works really well, and brought a fresh feeling after reading so many books told in the same limited 3rd person viewpoint. One trick that Neuvel tries to pull with this format is an unknown narrator. The person who conducts most of the interviews attempts to keep himself a mystery during the book—and this element really didn’t work for me. Because we only get to know a few characters in the book, and most all of them have met and been interviewed by the narrator, I feel like the narrator will end up being someone we don’t actually know, and therefore the reveal won’t be a shock. The overall story is very intriguing. It’s a mix of a conspiracy story, mystery, military tale, and HOVER FOR SPOILER. The interweaving of so many layers makes it really gripping, and I enjoyed the story the whole time I was reading. It was a very quick read, despite the plot sometimes not moving super quickly (and sometimes jumping over months at a time), so I felt the plot was overall well written. Two elements in particular that the book excelled at were the mythological aspect underlying many of the discoveries that were made, and the linguistics applied while deciphering the “foreign” texts. While both of these were done with very few actual details, and much of the story was implied, the parts that were there were done very well, and I loved the depth they added to the story. My biggest complaint with the story is the ending—or lack thereof. I didn’t feel like there was actually any climax or resolution to the story. It doesn’t feel like the first book of a story—it feels like the first part of of a larger book. This really disappointed me, and I honestly don’t recommend reading it until you can read the second, and maybe third, parts. This really ruined my sense of enjoyment, as the book didn’t give me any closure, or really even that much indication that the end was coming, until I turned the last page and there simply wasn’t another page. 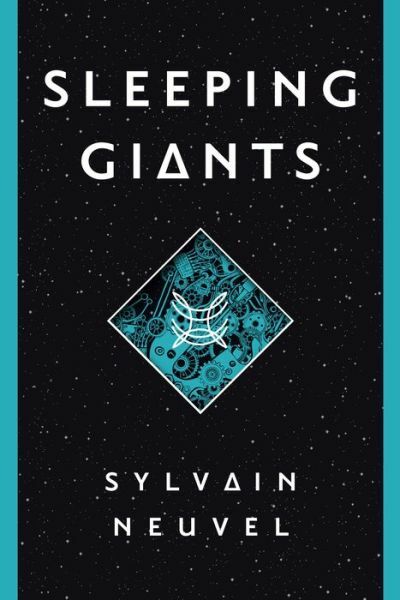 In summary, Sleeping Giants was a really interesting read that pulled me through, layering multiple plots very well with a cool storytelling style that only occasionally felt stretched, but let me down significantly at the end when there was no real climax or conclusion to the book. I give it 3 of 5 stars, and recommend it as part of the series, perhaps to be read once the other books have been released. Hey all! Mark and Shannon here. We’re going to talk a little bit about what’ll be happening with the blog this coming year, including our goals and we want to give you some idea of what we’ll be posting when. We’re planning to kick it into gear this year with a minimum of three posts, two of which will be reviews, every week! It should be fun. It’s a lot more than either of us have done for a sustained amount of time before, so yes, we’re a little bit nervous about things. Yes, we know the plan is a bit ambitious. But we think we can stick to it, and we’re happy that you’re along for the ride. Our weekly schedule will hopefully look something like this: One review on Tuesday, one “other” post on Thursday, and another review on Saturday. At least one of the reviews each week will be a book review, but we can’t promise that they both will be. As you may have already noticed, I (Shannon) have been reviewing some comic books, and I’m hoping to branch into visual novels as well. We’re not currently receiving any review copies other than ones we happen to get by luck, but we’re hoping to change that eventually, once we have this whole schedule thing down a little bit more. We’ve signed up for a Netgalley account, which I (Shannon) will likely be making the most use of. I (Mark) am not much of an e-book person, so I’m hoping I can pursue physical review copies a bit more. The “other” posts will be in a wide variety of areas, though we’ll try to keep most of them related to the blog, reading/reviewing, and us. We have a lot of convention reports coming up, including Mark’s report from WorldCon last year, Shannon (and possibly Mark)’s report on ICFA this year, Mark’s JordanCon report, and perhaps we will throw in a report or two on any signings that we go to that end up being particularly fun. I (Mark) reserve the right to write random Sanderson posts when I want to, too. We look forward to seeing everyone in the comments section in the new year!